Beautiful old color Vaugondy map of Belgium, the Netherlands, and France. Comté de Flandre où se trouve distingués les bailliages de Berg St. Winox, de Gurnes, de Bourbourg, de Bailleul, et de Douay, les Chatellenies de Cassel, de Lille, d'Ypres, de Courtray, d'Oudenarde, le Tournesis, le Franc-de-Bruges, le Burgraviat de Gand, le Pays de Waes, le Seigneurie de Dendermonde, le Comté d'Alost. Par le Sr. Robert de Vaugondy, fils, Géographe ordinaire du Roi. 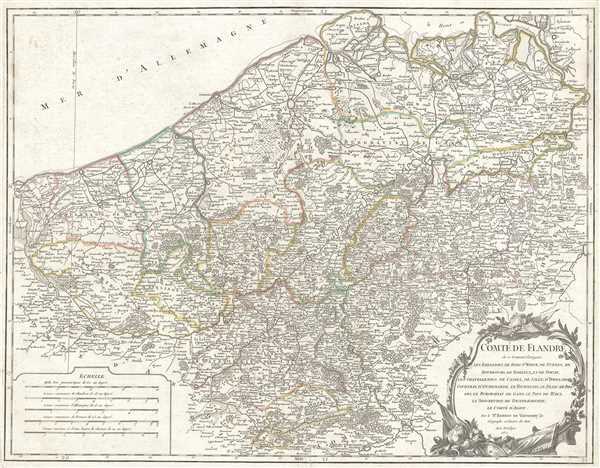 This is a 1752 Didier Robert de Vaugondy map of Flanders. The map depicts the northern half of Belgium, the extreme southern portion of the Netherlands, and extreme northeastern France, from the English Channel (Mer d'Allemagne) on the left to the Duché de Brabant on the right and from the Netherlands on the top to northeastern France on the bottom. The map depicts the contemporary political divisions, which Vaugondy lists as bailiwicks, castellanies, and burgraves. Forests are depicted in profile. The cities of Dunkirk, Lille, Bruges, Alost, and Valenciennes are depicted. A decorative title cartouche is depicted at the lower left corner. This map was published in Paris by Gilles Robert de Vaugondy in the 1757 edition of his Atlas Universel. Pedley, M. S., Bel et Utile, p. 163, 170. OCLC 51051474.